Build a Professional Website FREE! Our unique e2source website package offers you the most economical website solutions available anywhere plus the ability to get your website online quickly and easily, with no development cost, and with no technical knowledge required. Get Started Now! 30 Day FREE Trial! There is no contract of commitment, you can cancel at any time. 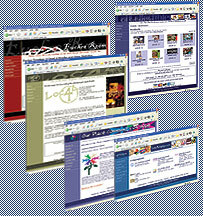 With the e2source economical website solutions, you get all the powerful features of a custom developed website, free automatic upgrades and enhancements, easy to use administration tools to update your site quickly and easily from anywhere for one low monthly services & hosting fee, based on the features you use. Click on a link below for additional information on our most popular features available, as well as low monthly pricing, with our e2source website package. We also offer a Getting Started Website Package, should you prefer to have us initially build your website for you. We also provide a monthly maintenance package if you prefer to have us handle all the updates to your website. However, you always have access to the administration area to manage the content of your website yourself, anytime, from anywhere, at no extra charge!